The library has a display case across from the circulation desk that features different themes and displays throughout the year. The current display is entitled "Lincoln Bicentennial." It features interesting facts about Abraham Lincoln in celebration of the bicentennial of his birth, which we are celebrating this month. Abraham Lincoln was born on February 12, 1809 in Hodgenville, Kentucky. He was the 16th President of the United States. 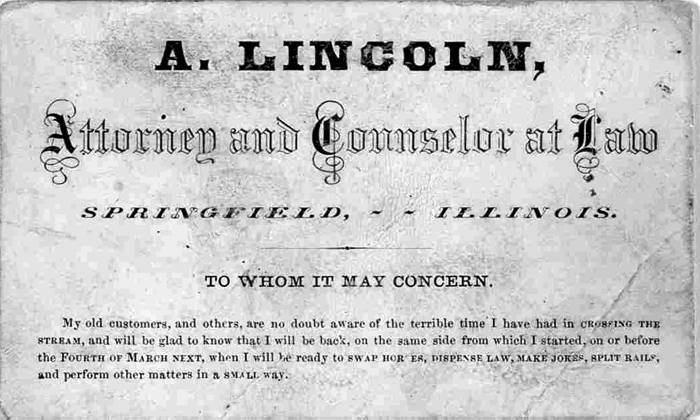 He died on April 15, 1865, the morning after being shot by John Wilkes Booth in Ford's Theatre in Washington, D.C.
Below is a business card created by the Democratic committee during the Presidential election of 1864. The business card reads: "A. Lincoln. Attorney and counselor at law. Springfield, Illinois ... My old customers, and others, are no doubt aware of the terrible time I have had in crossing the stream, and will be glad to know that I will be back ... ready to swap horses, dispense law, make jokes split rails and perform other matters in a small way "
Lincoln's Second Inaugural Address is regarded as one of the finest American speeches and it is inscribed on the walls of the Lincoln Memorial in Washington, D.C. To read the complete text of the speech and to learn more about Abraham Lincoln's second Presidential Inauguration, please visit Presidential Inaugurations at the Library of Congress. During Lincoln's four years as President, the American flag existed in three different versions. The 33-Star American flag was flown from 1859-1861. The 34-Star American flag was flown from 1861-1863. The additional star represented Kansas. Even after the southern states seceded from the Union, President Lincoln refused to remove their stars from the flag. The 35-Star American flag was flown from 1863-1865. The additional star represented West Virginia. President Lincoln was the first president to be featured on a circulating American coin when his image was cast on the one-cent coin in 1909, in celebration of the centennial of his birth. In 2009, four different one-cent coins will be issued by the U.S. Mint to celebrate the Lincoln Bicentennial. Each design will represent a period of Lincoln's life, beginning with his early childhood in Kentucky and ending with his presidency. For more information about the history of the one-cent coin in America, as well as the 2009 Lincoln Bicentennial One-Cent Program, please visit the U.S. Mint.